Watching Ryan at hockey practice one night earlier this week, I came to a realization. If I had the same drive, desire to improve, and willingness to work that he now shows, I might have been a much better hockey player. In the last year, Ryan has begun to take his hockey much more seriously. Not that he wasn’t serious before, but he has begun to understand the things he must do to improve. He has learned the meaning of hard work, and pushing himself. It started with a goal — one he set for himself. When our town formed a middle-school team and entered it into a local league this past spring, Ryan began to look past what was right in front of him. Maybe it was having the town name on the jersey, or the fact that the team was led by the coach of our local high school. Either way, Ryan started to focus on making the high school team. He has another year in middle school to improve enough to reach his goal. Since he set his goal, he has attacked it with vigor. 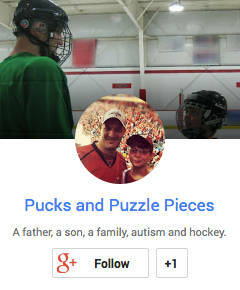 In addition to his summer hockey clinic, he goes to public skating every Saturday and Sunday, and the occasional weekday. We’ve done stick and puck sessions together. And when some home remodeling took away his backyard street-hockey court, he didn’t pout. Instead, he goes outside and stickhandles in place, eyes up, just as I showed him. He does this several times a day on weekends, in 10- to 15-minute stretches. And that’s on top of the thousands and push ups and dips he’s done this summer. At the beginning of the summer, he struggled to perform a single full toe push up. These days he does a dozen set of 10. Every day. At one of our stick and puck sessions, we were taking a breather between drills when I casually suggested a way for him to get more out of his hockey practices. I told him that while he’s waiting in line at his turn for a drill, he should grab a puck and stickhandle in place, making sure to keep his eyes up and not look at the puck. It’s a basic skill, and a critical one. Players who put their heads down when carrying the puck put themselves at risk for huge, potentially concussive, hits. It’s the kind of little thing that kids who are serious about the sport do to improve on their own. My son is not a naturally gifted athlete. If he’s going to get better, he has to do more than just what the coaches tell him to. To be honest, it’s the kind of thing I wish I had done more of as a player. I loved playing hockey (and baseball, and football and swimming and any other sports I tried) but I don’t know that I ever truly had the dedication it takes to be more than just OK. So when I dropped in on practice the other night (did I mention we drop him off now?) and watched him during drills, a smile crossed my face as I saw him grab a puck and work on his stickhandling while waiting in line for his turn. Not once or twice, but every time. I looked closer. His eyes were up, just like I told him. And you know what else? He’s already much better at it. Focus. An extreme attention to detail. Drive. Willingness to repeat something over and over until it’s perfect. Those are qualities possessed by a lot of great athletes. They’re also characteristics of autism. I’m not suggesting my son is headed for a professional career. But I am saying that his particular brain wiring is a strength in the pursuit of becoming the best player he can be.